There is of course, a saying that behind every great man, there is an even greater woman. And by extension, it could be said that behind every notable sire, there is an ever greater dam. This would certainly seem to be the case where 'Daisy Nita of Thorpe' is concerned. For the fame of all the blues of the 'Thorpe' dynasty can be directly traced back to one common ancestral female, the originating matriarch of Thorpe Underwood Hall, little 'Daisy Nita'. Looking back with the advantage of hindsight, we can now see that this female was the 'power behind her son 'Orange Blossom' of Thorpe's throne, as the original King of that dynasty. 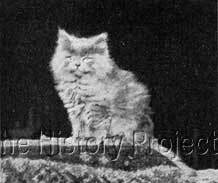 And we only have to review the unusual descriptions given of Daisy, to take notice of the fact that she looked 'different' to other Persian cats from within her own era. We are equally fortunate to be able to see these actual traits in her photo, the great depth to her very strong chin, and the extra short muzzle, which has given the early indication of a 'flatter' face. Knowing as we do that a female from one grandson (Zeus), namely 'Queen Mab of Thorpe', was line-bred to a male from a second grandson, (Neila Billi) namely 'Blue Cap of Thorpe' to produce the stunning 'Blue Lightning of Thorpe', we can easily trace how this 'look' began to filter through the generations to become the preferred head type of the future. Very quietly, over the decades, and through the auspices of her many 'blue' grandsons and great grandsons, who have been systematically line-bred upon, the genetic influence of this one little female, with her unique 'pug-like' expression has totally permeated and altered the entire Persian breed. She and her progeny provided the genetic possibilities, and breeders, through preferential 'selection', have completed the picture. 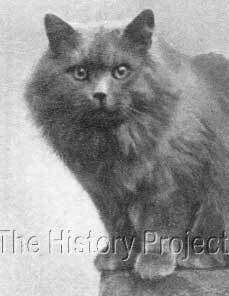 Very few Persian lines, if any, would have no trace of an 'of Thorpe' cat in their ancestry and it is extremely likely that upon extension, there would be multiple such cats in their background. Thus 'Daisy Nita' lives on in innumerable cats, and her pugnacious expression has left an enduring legacy. Never have we seen a cat with such a short face. When 'Daisy' was born on 13th April,1898, little did the cat world at large know that it was the beginning of a new era, and this little lady would become the matriarch of the yet to be born 'of Thorpe' dynasty of Blues. Daisy's own sire was a Blue named 'Beauty Pearl' who came down from 'Peter of Tovil' and who carried the lines of Eng.Ch. 'Glaucus' and Eng Ch. 'Patrick Blue'. 'Daisy's' dam was Glaucus Nita (after whom she herself was named), a direct daughter of the same Ch. 'Glaucus', which also makes her a half-sister to 'Moko', who was probably his best-known son, and half-sister to 'Lockehaven Beadle' (formerly 'Bumble bee'). 'Glaucus' own pedigree included a line-breed on 'Ch. Perso', through his dam 'Zeta' and again through his sire 'Turco' who is purported to also be a grandson of 'Ch.PERSO. In fact, 'Perso' seems to appears in 'Daisy Nita's pedigree no fewer than five times, possibly more. 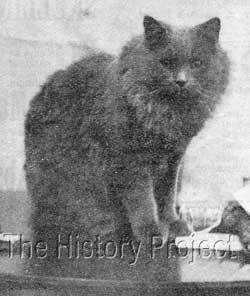 When we consider that 'Perso', who was a Blue Smoke, was also the sire to the Chinchilla (silver), Ch. 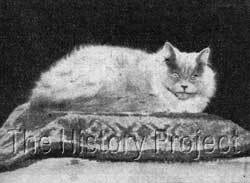 Silver Lambkin, it becomes patently obvious as to which foundation longhair cat, has probably had by far the greatest influence on the Persian breed, regardless of colour. We know that Mrs. Slingsby purchased her foundation blue female from Mrs. Cresswell. No full siblings are recorded. Apart from an initial 2nd at Manchester recorded above, no mention is made of Daisy Nita having been shown again. Only three male progeny of Daisy Nita are listed. The most well-known is her son 'Orange Blossom of Thorpe' by Mrs Ransome's 'DARIUS'. Another son, 'Love-In-A-Mist of Thorpe' was sired by 'Eng.Ch.Blue San Toy'. This son went on to sire a Blue female named 'Charlotte of Thorpe', who when bred back to 'Ch.Bluecap of Thorpe, produced 'Arnold of Thorpe' and what was the beginning of another line of Thorpe descendants! The third was a close in-breeding back to her son 'Orange Blossom', which produced the male 'Weybourne Sonny' and a smaller line of descendants with limited impact on pedigrees. Four of 'Daisy Nita's grandchildren, by 'Ch. Orange Blossom of Thorpe'. Above left is Ch. Neila Billi of Thorpe1. 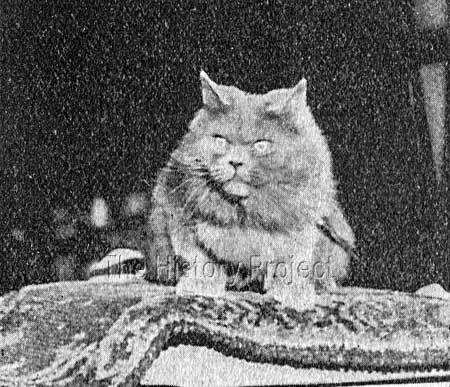 , from a 1903 issue of 'Our Cats'3. Above right, is an image of Ch. Zeus of Thorpe3, from 'Cats for Pleasure & Profit' (1903) by Frances Simpson1. 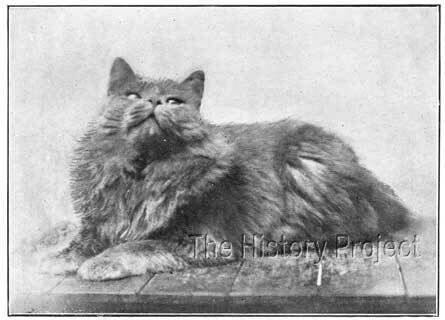 Photo: Image from an article in Our Cats, March 1903, courtesy of The Harrison Weir Collection. These three images help to demonstrate how 'Daisy Nita's unique foreshortened muzzle and 'pug' face influenced her descendants down the generations. The first image is of course, 'Daisy Nita'1 born in 1898, with the image dating from 1903. The second portrait is that of her double great-grandson, 'Blue Lightning of Thorpe'4, born 1910, with photo taken in 1912, (so approx. 12 years apart); with the last photo being that of 'Gloria of Pensford'5, bred by Joan Thompson in 1946. Note how similar in the muzzle Gloria is to her predecessor, of some 48 years earlier! Upon researching Gloria's pedigree, we stopped counting after we found 'Daisy Nita' in the background more than 80 times!! Photo set courtesy of The Harrison Weir Collection. Estate of Gladys Cheetham, courtesy of The Harrison Weir Collection.